Our team can assist from square one by talking through basic requests and concepts before developing a design you like and a finished piece you’ll adore. With a library of ideas from past jobs, a lifetime of design experience, and tons of art and image catalogs at our disposal we have the resources to get your project started in the right direction very quickly. Our experienced designers have been creating advertising and marketing pieces for decades and are trained in the design fundamentals that separate professional work from amateur creations. If you don't have a logo, or are currently using a logo that doesn't reflect well on your business then we can definitely help. 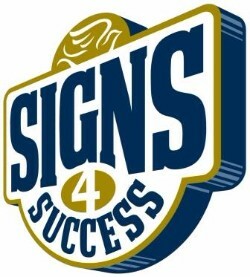 Whether we are designing a logo from scratch or simply updating an existing logo to make it more current or effective, Signs4Success has the expert perspective you need when tackling questions about these and other branding devices. This includes things the average person does not think to consider, such as what colors say about you and how to create different treatments of a logo for different backgrounds and medias. Does your logo just as well on a billboard as it does on a business card? Does your logo reproduce the same on paper as it does on the web? Do you have a style guide to help your logo stay consistent from one print run to the next? Can your logo be printed in black & white or does it just come out as a muddy gray mess? We consider all of these things, and can make sure you are set up with logos that will work great no matter where you decide to use them. When it comes to large signage, like a wall mural or a vehicle wrap for instance, having an experienced sign designer at your disposal is key for getting the results you want. This is because most graphic designers work on small things where the design rules are different, and never stop to consider the most important part of sign design: viewing distance. A sign that is meant to be viewed from a freeway 100 yards away must be designed differently than a business card because they are viewed in a different way and for a different length of time. For signage it is also important to have a primary message, secondary message, and a call to action- and to weigh this information accordingly in the design. Because we employ our own amazing designers, we are able to turn around artwork quickly and efficiently. Revisions are typically the same day or next day at the latest, and you will have the ability to directly communicate with your designer. We want it to be easy for you to get amazing artwork!